"How can I best describe Metal Gear Solid V: Ground Zeroes?" I asked myself. "Ah, yes. I'll describe it as a small plate at an expensive restaurant." So, okay, let's do that: You're at one of those restaurants where they serve gourmet food in very small portions. You've been given your entree—a intricate thing that looks as much like an exotic flower as a meal—and you take the first bite. It's delicious! You begin to cautiously dig in, ever mindful of the fact that this… well, this is all there is. Soon it'll be gone, and it's a long wait for the next course. That's Metal Gear Solid V: Ground Zeroes: An often beautifully constructed game that for all its good ideas and slick execution remains quite obviously a sliver of a larger, more complete game. Ground Zeroes is billed by publisher Konami as the first part of the Metal Gear Solid V saga. It's even got Metal Gear Solid V right there in the title, and right there on the box. It would be more accurately described as the first, much smaller, part of the saga—the second part will be the allegedly saga-sized open-world game Metal Gear Solid V: The Phantom Pain, which will arrive at some indeterminate point in the future. In other words, The Phantom Pain will be the "real" Metal Gear Solid V. Ground Zeroes is something smaller and more difficult to quantify. Both Ground Zeroes and The Phantom Pain tell the story of Big Boss, aka Snake, played this time around by Kiefer "Kiefer" Sutherland. Ground Zeroes picks up a few years after the end of 2010's portable game Metal Gear Solid: Peace Walker and acts as a prequel/mid-quel (is that a thing?) connecting the 2010 game with The Phantom Pain. Like previous games in the Metal Gear series, Ground Zeroes is a third-person stealth game in which you, with the aid of gear both high-tech and improvised, guide Snake as he sneaks around military outposts and carries out a number of various objectives, all while engaging with or avoiding patrolling guards as you see fit. You can play peacefully, knocking out or dodging guards entirely, or you can play violently, taking down dozens of dudes by using rocket launchers, grenades and machine-guns. The choice is yours. The story takes place in 1975, a little while after the events of Peace Walker. Two of that game's main characters, a young woman named Paz and a little boy named Chico, have been taken prisoner by a shadowy military group called XOF, its name the inverse of Snake's FOX outfit. Snake is tasked with heading to Cuba, infiltrating a black-site military prison called "Camp Omega" where they're being held, and getting them out. Ground Zeroes consists of a single story mission, which is made up of that two-stage rescue operation. The whole thing takes place during a single rainy night in a single location, as Snake makes his way through Camp Omega, locates his targets, and carries them to one of several designated helicopter pickup points. A welcome majority of Ground Zeroes' runtime is spent actually playing the game, something that could not always be said of other more recent MGS games. Metal Gear director Hideo Kojima is now infamous for his fondness of overlong, non-interactive cinematic sequences. "70% of my body is made of movies," reads his Twitter bio, in a winking nod to his critics. In between, it's all game. That's a welcome change of pace for Kojima, and the strongest point in Ground Zeroes' favor: It may be short—my meticulous playthrough of the main mission clocked in at three hours—but it's almost all beef. Camp Omega is an intricately designed, fun-to-explore place, a large military compound loaded with guards, watch-towers, and roving vehicles. There is great joy to be found in poking and prodding at its various interlocking systems, just to see how they react. This is surely the most mechanically sound, fluidly designed Metal Gear Solid game yet made. Snake is as lithe as he's ever been, and for the first time for me, a Metal Gear game's controls felt immediate and intuitive. There's no button to "stick" to cover; rather, when Snake is crouched, he'll push up to corners and other small objects automatically. It works pretty well, better than the recent Assassin's Creed games but not as smoothly as other recent non-sticky games like The Last of Us or Tomb Raider. Crawling is still a bit confusing at first, but feels easier to manage than ever. Snake's close-quarters combat moves have been streamlined and better explained, making it much easier to execute flashy melee chokeholds and interrogations. Another nice addition: Any time Snake is spotted, everything goes into slow-mo for a moment, and quick players can react before every guard in the area is alerted. At any given juncture, players can choose to act in any of a number of ways, provoking any of a number of responses from their enemies. A purely silent approach tends to be the best—and most satisfying—way to play, but more so than any past Metal Gear game, Ground Zeroes leaves the door open for guns-blazing action. The game doesn't control as well as, say, Gears of War, but Ground Zeroes' opened-up action is smooth and, when the tanks roll out and the red barrels start exploding, awfully bombastic. Playing Ground Zeroes and listening in on guards' radio conversations, there is that familiar Metal Gear sense that your enemies are all interconnected, and that if alerted, they may react to you in any of a number of unexpected ways. That initial impression eventually faded as I gained mastery and learned the guards' reactions and routines, but some neat surprises still lurked in the shadows. For example, at one point I snuck up behind a guard as he was using his radio to check in. I took him out silently, only to hear the guy on the other end of the radio worriedly call out, wondering why his friend had been cut off mid-sentence. Shortly after beginning the game, I spent a good thirty minutes just making my way back and forth between two buildings, knocking out guards, seeing how long it would take them to wake back up, trying to distract them and see how close I could get to them before they noticed me. If you're into that sort of experimentation, you'll find a rewarding chemistry set in Ground Zeroes. It's in its story that Ground Zeroes feels most truncated. It contains scant few substantive new developments in the tale of Big Boss, Mother Base, Paz, Huey, Metal Gear ZEKE and the rest—really, only one major development, which comes at the very end. Considering the limited scope of Ground Zeroes, Kojima and his team were wise to focus mostly on gameplay over story, but given the Metal Gear series' grand history and convoluted mythology, it's hard not to wish there'd been more, particularly for a game with METAL GEAR SOLID V emblazoned on its box art. What narrative there is, though, is plenty engaging, a tense short-story told in Kojima's signature grandiose style. It's even topical: Camp Omega may be cold-war fiction, but it has been deliberately darkened by the long shadow of the modern US war on terror. At every turn, Kojima evokes the cages and high walls of the infamous US detention camp at Guantanamo Bay; the rain-speckled searchlights, the US military guards patrolling in billowing green ponchos. The game also frequently conjures the brutal excesses of Abu Ghraib prison, with so-called enemy combatants kept in animal cages with black bags over their heads, their lives reduced to a horrific and seemingly endless ordeal. What Kojima actually has to say about all of that remains to be seen, but there's a certain sharp spark even in making players explore and confront a place like Camp Omega. The horror of the camp is stated much more unambiguously than it was in, say, Splinter Cell: Blacklist's comparatively weak-stomached tour of Gitmo. As a side-objective, Ground Zeroes makes it possible for players to rescue the hopeless prisoners of Camp Omega. As I carried one nameless prisoner to a helicopter pickup point, he cried on my shoulder, telling me he had long given up hope that this day would come. It was overly simplistic and clumsy in that way video games still tend to be (wouldn't Snake at least take the bag off the poor guy's head?) but still, I can't say I was entirely unaffected. While for the most part Ground Zeroes implies torture and other dark practices without depicting them, toward the end it takes a shocking turn for the explicit, and the final cutscene contains a graphic depiction of one of the most grisly things I've seen in a game. It didn't really work for me, nor was it lost on me that this most breathtakingly bloody, painful act was being perpetrated upon the game's sole female character. The image of a woman in torn leggings and a bra, strapped to a chair and prodded with electrically-charged batons, is certainly provocative, as is the sort of blood-and-guts splattershow that occurs near the end of Ground Zeroes. But is this really the kind of provocation that benefits the Metal Gear series? Kojima has said that depictions of torture are necessary for the kind of revenge tale that The Phantom Pain will tell, but I'm skeptical. In my many years playing video games, I think I've seen enough of the wanton suffering of women. Show me something else, Kojima. Ground Zeroes offers such a small sliver of a much larger narrative that it's difficult to draw too many conclusions about any of it. Right when things are getting interesting, Ground Zeroes ends, and with a tease for the next game, no less. "Coming soon in Metal Gear V: The Phantom Pain!" it brays, and for a moment Ground Zeroes feels every bit the for-pay advertisement that it has been accused of being. The side-ops are a good deal of fun, and will let dedicated players wring every last drop of flavor out of Camp Omega. Each mission has Snake entering from a different point, with different goals in different areas and from what I could tell, varied guard deployments. For example, one tasks you with meeting an informant, another with assassinating two visiting soldiers, a third with blowing up the camp's anti-aircraft guns. Each one also allows you to exfiltrate prisoners of war and track down collectables, and each can be tackled with stealth or violence. 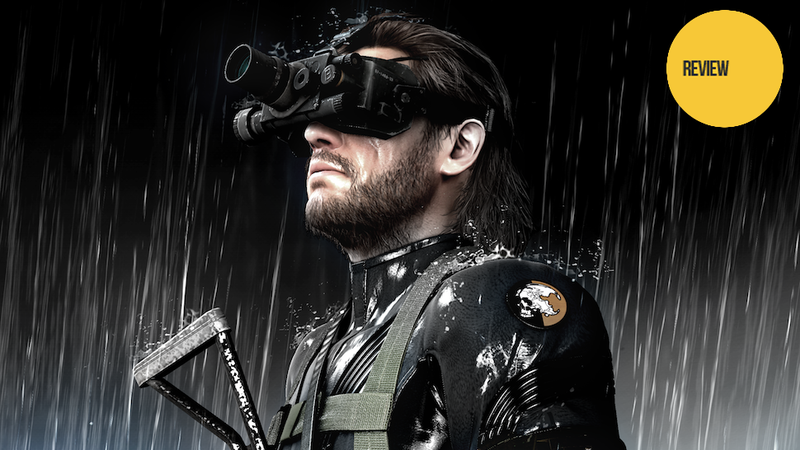 Version Check: Ground Zeroes will be coming out on Xbox One, Xbox 360, PS4 and PS3. I played through the PS4 version, which looks sharp in 1080p resolution and runs at a smooth 60 frames per second. It's a handsome game, though it looks mostly like a high-res PC port of a last-gen game. I haven't seen the other versions in action, but it's been established that the Xbox One version runs at 60fps with a comparatively rough 720p resolution, while the last-gen versions both run at 720p and 30fps. The PS4 version is clearly the one to opt for if you've got the option. Price Check: It's impossible to ignore the fact that Ground Zeroes is going to cost $30, particularly given that it's going to sit on store shelves announcing itself as Metal Gear Solid V. To put its size in Metal Gear terms: Ground Zeroes feels a lot like the tanker mission at the start of Metal Gear Solid 2, albeit with a larger and more complex tanker. And, of course, sold separately in advance of the full game. Whether or not a game of this size is worth $30 is a question each potential buyer must answer for him or herself, but it is certainly a question worth asking. At the Konami-hosted review event I attended last week, I spent a couple of hours taking on side-ops and I enjoyed myself. The missions I played took place on a bright, sunny day, which served the dual purpose of making them more difficult than the nighttime story mission and helping them look and feel substantially different, despite taking place on the same map. It's certainly to the game's credit that once I install it on my home console, I plan to play through the entire thing all over again and try to earn better scores with different strategies. It also sounds like the PlayStation exclusive side-op will be an entertaining bit of retro-fueled fan-service. My time with Ground Zeroes was satisfying and enjoyable. It was also brief. As much fun as I was having, each thought I had was appended by "…and it'll be even cooler in The Phantom Pain." The new controls are great… and I sure can't wait to see how they'll work in The Phantom Pain. The streamlined inventory system is well-constructed and easy to use… and I bet it'll be great in The Phantom Pain. Kiefer Sutherland seems like a capable, interesting Snake… and I'm looking forward to seeing him get a few more lines in The Phantom Pain. Still, as small dishes go, Ground Zeroes is a tasty one, and it's been a long time since the last course. It'll tide us over, for now. For a second opinion on the game, check out this review by twizm over on TAY, our reader-run blog. Hideo Kojima&apos;s latest game shows that length is not a detriment to quality.